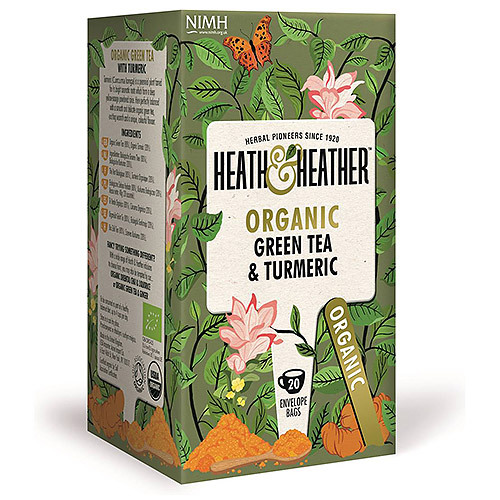 Heath & Heather Organic Green Tea & Turmeric teabags are a perfectly balanced blend. 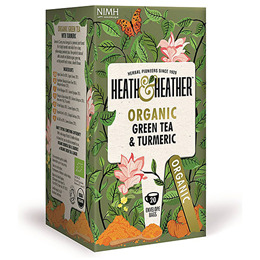 Smooth and delicate organic green tea with the exciting warmth of turmeric makes a unique, colourful flavour. Organic Green Tea (80%), Organic Turmeric (20%). Allow freshly boiled water to cool for a few minutes before adding your teabag, then simply infuse for 2-3 minutes before consuming. Below are reviews of Heath & Heather Organic Green Tea & Turmeric - 20 Bags by bodykind customers. If you have tried this product we'd love to hear what you think so please leave a review.